Livestock, birds and other animals are enduring extreme hardship in southern Iceland, where the cloud of Eyjafjallajökull’s toxic volcanic ash threatens their very lives. The animals are at risk of fluoride poisoning if they inhale or ingest the ash. The fluoride in the ash creates acid in the animals’ stomachs, corroding the intestines and causing hemorrhaging. It also binds with calcium in the blood stream and after heavy exposure over a period of days makes bones frail and causing teeth to crumble. 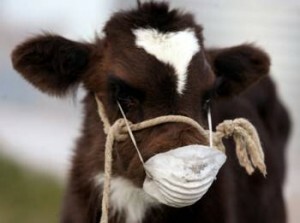 “The best we can do is put them in the barn, block all the windows, and bring them clean food and water as long as the earth is contaminated,” said dairy farmer Berglind Hilmarsdottir. 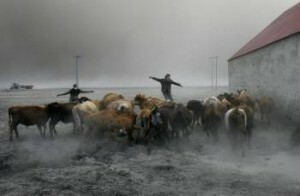 Farmers rushed sheep, cattle and horses to shelter after they got lost in a fog of ash in areas near the erupting volcano. Depending on the different types of magma involved, some volcanic eruptions send out fluorine aerosols, which become attached to ash particles.If animals feed on grasses covered with fluorine-filled ash, they can contract fluorosis, a fatal bone disease. Since Eyjafjallajokill erupted, hundreds of farms were evacuated but many farmers have returned to tend to their animals despite fears of volcanic floods. 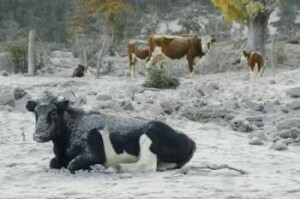 Hanna Lara Andrews, a dairy farmer whose farm is at the foot of the Eyjafjallajokill glacier, said so far, livestock seemed to have survived without any problems. 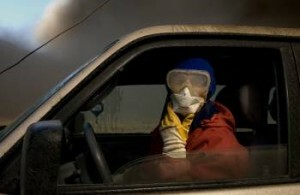 ‘The biggest problem is that the roads have been destroyed so the milk can’t be collected,” she said. “We can only stock a certain amount on the farm; if the roads aren’t repaired soon, we will have to throw it away. Meanwhile, the president of Iceland said the government is aware of the situation. “We are all doing our utmost to make sure that the farming community in this area survives this disaster,” President Olafur Grimsson said in an interview with Reuters Television. Ponds have turned into pools of cement-like mud and geese have had trouble escaping because their wings are heavy with ash. 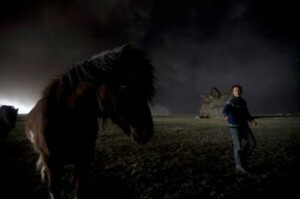 Soon after the eruption, farmers banded together to search for hundreds of shaggy Icelandic horses, who panicked and got lost in a downpour of ash that turned day into night.